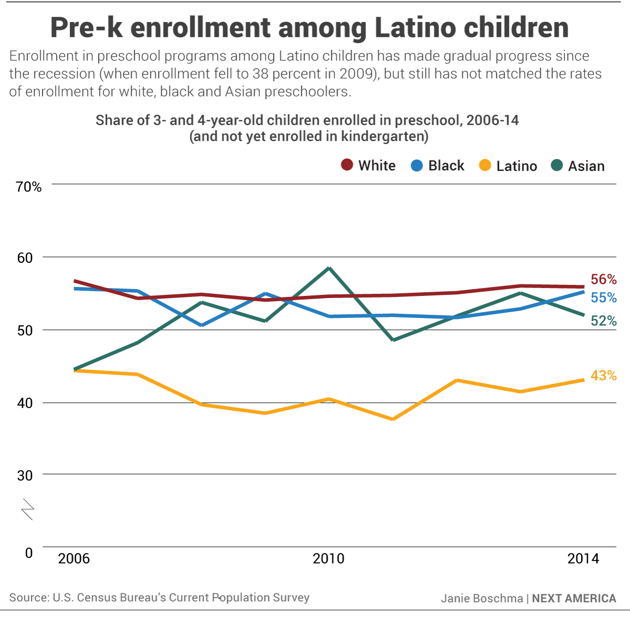 The bad news: Latino children are not only less likely to be enrolled in preschool, they’re also less likely to be prepared for kindergarten. The good news: New research conducted in Miami shows that early-childhood education can close that skills gap for low-income Latino students, both at the kindergarten level and through the end of third grade. Nationally, Latino children represent a quarter of all kindergarteners, according to the Census Bureau. That ratio is only expected to grow in the coming years. Unless they arrive ready to learn, the potential skills gap could have far-reaching implications, the authors of a report from the National Research Center on Hispanic Children and Families warn. “Given these demographic trends, and what we know about their economic characteristics, how Hispanic children fare is going to have a lot to say about the future of our country," says Lina Guzman, who leads research for the center. Using data from the Miami School Readiness Project, Guzman and her colleagues followed nearly 12,000 low-income Latino preschoolers who attended either a public pre-k or a subsidized center-based program, the two most popular preschool options among Latino families in Miami. By and large, those students were more prepared for kindergarten compared to national averages. The children later also scored well on third-grade state reading assessments, with more than 90 percent earning a passing score. On average, third-graders who had attended a public pre-K program earned an average GPA of 3.23; students attending a center-based preschool earned about a 3.0. The benefits were also pronounced for bilingual students (or dual-language learners). Almost three-quarters of low-income bilingual students entered kindergarten with either an advanced or proficient command of English. “These [results] are consistent with the growing body of research that shows the benefits of early-care and education programs," Guzman said. "I would expect that, as we see more expansion nationally at the preschool level, that we'll have growing evidence that will continue to show that." 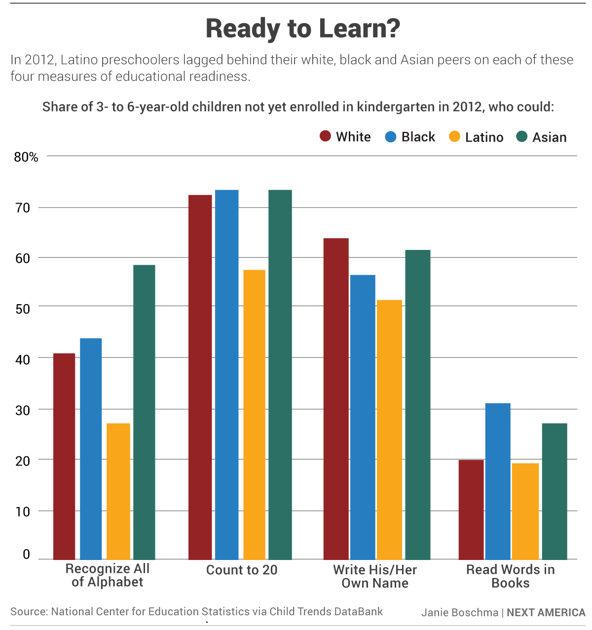 Nationwide, Latino preschoolers lag behind their white, black, and Asian peers on every measure of educational readiness, as the following chart shows. Expanding access to pre-K education seems to be the solution to closing those gaps, especially for the low-income Latino students the report studied. "The fact that these kids are scoring above national averages is really promising," says Arya Ansari, coauthor of the report. "It's really about getting these children ready to learn so we set the foundation so they can succeed when they enter kindergarten. That's what we're seeing here in Miami." Although the study is specific to Miami-Dade County, the research does suggest that early intervention could improve long-term education outcomes for low-income Latino students nationally. From here, the findings may pave the way for follow-up research in other metro areas with growing Latino populations.